When you consider the deluxe bathroom, it is likely that your head will jump to visions of minimalism, clean lines and single, light colour. This may be because this modernist design style has remained a dominant trend for some time now, promoting the idea that a clean, fresh space is the answer to achieving a sense of calm, serenity and pure luxury. We would like to contest this popular mindset and show you how colour and pattern can be used to make your bathroom a poised and chic sanctuary. Designer Patrick Putney opted for wallpapering the ceiling instead of the walls in a mysteriously leafy print by Cole & Sons. The clever design ekes the patterned paper from the ceiling just down to a high level border which sits upon painted panelled walls. This is no new concept, the Victorians were advocators of the decorative ceiling in their lavish homes, wallpapering every inch of the space, with the principle that the higher the ceiling the more elaborate the decor. This modern interpretation pairs an ornate celling with clean, white walls, to gain a sense of drama and opulence without feeling overbearing or claustrophobic, achieving the freshness a bathroom space desires. Award winning Beauta Heuman has developed a studio known to create playful and imaginative interiors who work closely with their clients in order to reflect their unique personalities in their homes. A strong example of their work is a project designed for artist owners of a grand London house. 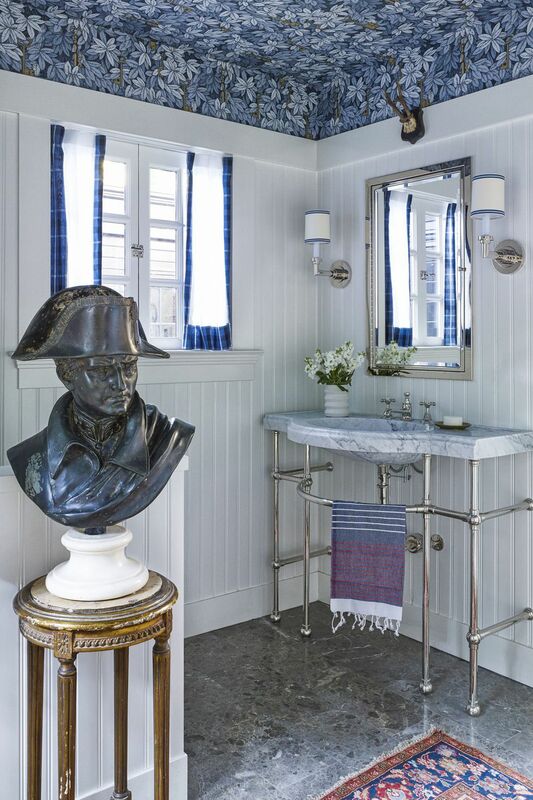 Every room in the house is bold in colour with distinctive fittings, and the bathroom is no exception. 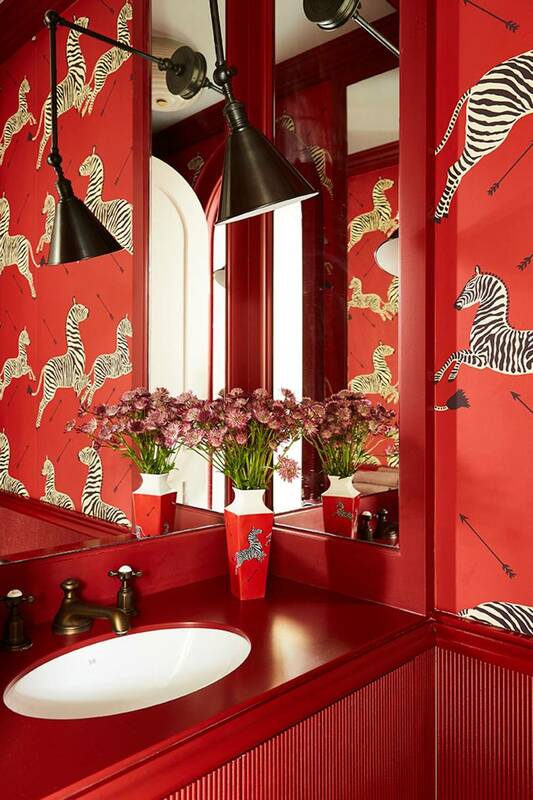 The use of pattern and full colour, specifically vibrant red, is rather daring but in fact works well in making the space feel intimate, warm and sensuous – and where better for that then the space in which you cleanse and pamper? Daughter of a notorious socialite, It girl and model Poppy Delevingne, is a true West Londoner. When she left her family home in Belgravia she settled nearby in a beautiful townhouse in Notting Hill. To ensure the decor did justice to the houses’ grand architecture, interior designer Joanna Plant was enlisted, with her studio’s philosophy to provide quality of finish with a dedicated team of craftsman and suppliers. 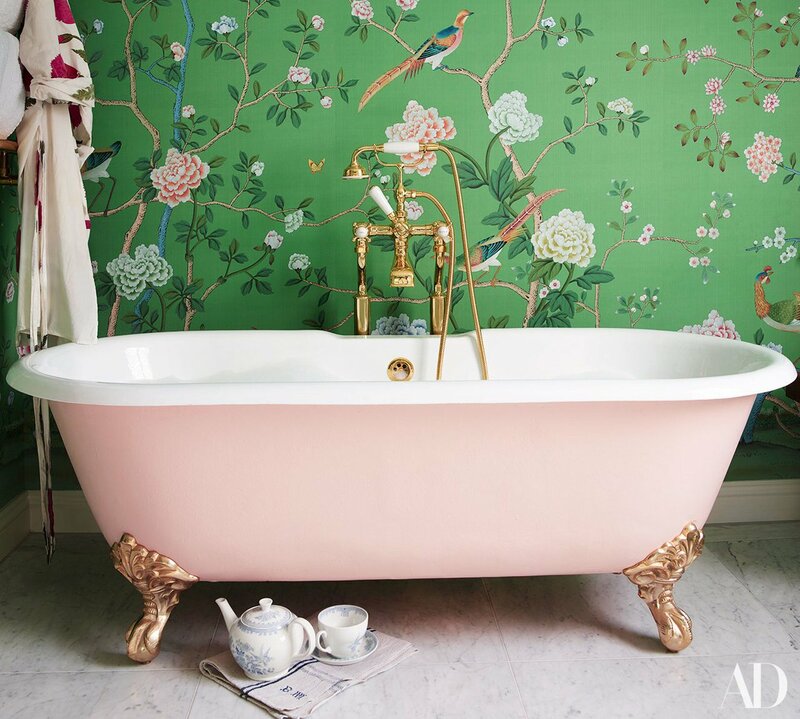 This was honourably lived up to in every room, but we particularly love the attention to detail in the master bathroom, with walls clad in an elegant, hand-painted silk covering from artisanal wallpaper brand, De Gournay. The skill in the painting is truly awe-inspiring, creating an indulgent, dreamlike space perfect for a young-at-heart English rose.